In this era of technology, customer experience is becoming the deciding factor for any business. The term “experience” not only consists of customer service but also a full customer lifecycle with that brand. We have two cloud customer service engines available in the market to cater to these needs: Salesforce and ServiceNow. They both provide various levels of services – some are similar and some are different. Let us walk you through both this software separately and then, we will be comparing them to see which outshines the other one. Salesforce is a cloud-based CRM app. CRM stands for Customer Relationship Management. Its job is managing and handling all the aspects of the relationship between an enterprise and its own customers, for instance, customer contact details, customer deals, customers’ support requests, etc. Moreover, it also handles storage of people’s details and details about seller organization. This makes the day to day activities much easier for customer-related businesses. It also helps to enhance the relationship with a customer, which in turn is good for the organization’s growth. It supports 4 platforms - web-based, iPhone, Android, and Windows. Due to his multi-platform support, it is used by any enterprise, irrespective of its size. From a call center to a tech Giant like Google, all are using Salesforce products to enhance their customer experience. 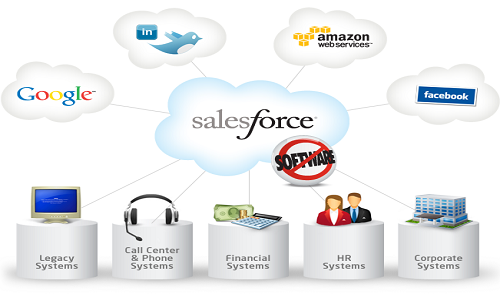 Now, let us explore Salesforce services which make it the great choice for CRM software. Below are the types of services Salesforce offers to an enterprise. Salesforce Sales Services enables your company’s sales teams to close deals and handle them line never before. It increases the productivity and pipeline will be filled with solid leads. This all will result in more wins without any software, hardware, or speed limits. Sales Cloud – helps to manage contacts and trace the opportunities from any mode of a device, be it desktop or mobile, at any time. Salesforce CPQ (Configure, Price, Quote) – Salesforce CPQ automates quoting, billing, contracting and ordering process. Through CPQ, you can build accurate and easy quotes, faster and cleaner proposals. You can enhance your customer support from the self-service portal to a customer help desk portal by using Salesforce Service Solutions. Service Cloud – It’s a service platform for customer service and support team. It enables you to provide faster and smarter support to your customers. Field Service Lightning – It delivers faster, productive, and intelligent onsite support by connecting the entire workforce. Marketing Cloud – Marketing cloud makes the most use of every customer interaction through personalized and cross-channel customer journeys. This makes the customer experiences exceptionally across web, mobile, email, social, and advertising. Salesforce DMP – Salesforce Data Management Platform (DMP) stores and activates your data to provide a valuable customer experience and to construct healthy consumer relationships across every touchpoint. Pardot – It is a market automation feature which supports email marketing, lead scoring, nurturing, and more. Commerce Cloud Digital – It engages shoppers with personalized, innovative, and AI-powered commerce solutions for marketing, promotions, merchandising across web, mobile, social, and more. Commerce Cloud Order Management – Through real-time inventory visibility, allocation logic, and order lifecycle management across all channels, it gives a “buy, service, and fulfill anywhere” type of experience to customers. It allows users to generate documents, checklists and spreadsheets which you can share with your whole team through Quip, and they can edit those documents as well. Salesforce Platform - Salesforce Platform is the one-stop solution for constructing, managing, running and optimizing apps by using the same technology. This is a major factor for the success of Salesforce. Lightning – Lightning helps you to build social and mobile apps using either click or code. Heroku Enterprise – Heroku is an open source language cloud application which is integrated with Salesforce data. It supports various languages like Ruby, Python, Java, Scala, Node.js, and more. Sales Analytics – Sales Analytics in Salesforce has the ability to gain pipeline visibility quickly which uncovers opportunities to grow the enterprise. It uses Einstein Discovery to discover hidden insights and get a smart recommendation which makes selling faster and smarter. Service Analytics – It gains deep insights from the team’s performances and these insights can then be converted into actions to enhance customer experience. These are only a few handpicked products described above. But the list is long. 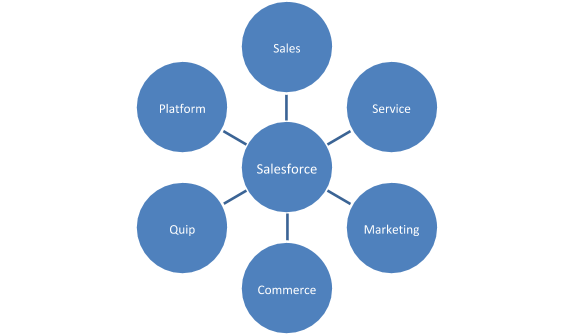 These services altogether make Salesforce one of the top CRM platforms across the world. ServiceNow is an IT Service Management tool which consolidates fragmented tools and legacy systems and automates service management process. 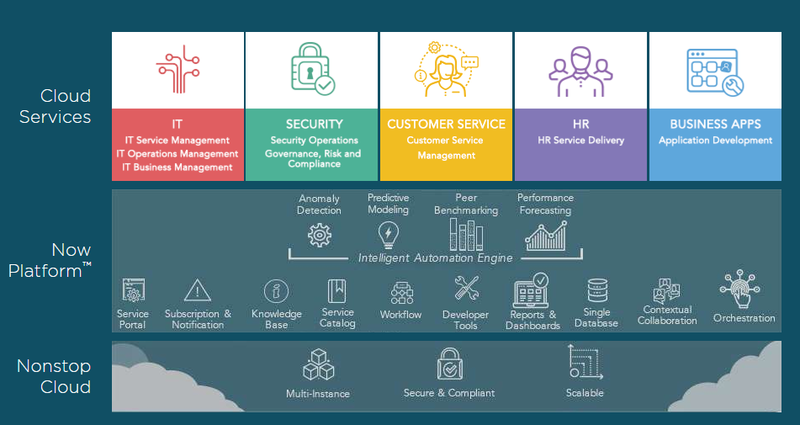 ServiceNow creates a better experience for employees, users, and customers by providing different services for IT, HR, customer service, security, software development and more. It follows the term “easy configuration, fast deployment”. It can easily integrate with other tools. ServiceNow automates all enterprise IT operations by creating a single system of record for all IT processes within an organization. This system consolidates IT strategy, design, transition and operation on a powerfully simple cloud platform. Let us explore what types of solutions are offered by ServiceNow for an enterprise. ServiceNow provides a single platform for automating all the business processes. The Now Platform supports all ServiceNow solutions using a single data model. It is an easy to use deployment environment. Business users can build low code solutions in it whereas developers can use its new and innovative rapid development capabilities to build apps on Now platform. All ServiceNow applications are built on the Now Platform. With the Now Platform, developers of all levels can significantly increase their productivity by reducing time-to-market and delivery. ServiceNow cloud is multi-instance infrastructure cloud which gives unique application design and database to each customer. This segregates data of one customer from other customer instances. All instances are always on. They are never offline or taken down for any XYZ reason. It is highly secure and scalable. These are some of the many important solutions offered by ServiceNow. Now let us compare these both and check which software outshines the other. The choice between Salesforce vs ServiceNow is totally dependent on your business needs. They both are excellent in their support and services, but they are not same. They are the solutions fitted for different types of customers. So, we would suggest you to choose Salesforce or ServiceNow according to your business needs and situation.